Don’t leave your fuel unprotected. When you leave the office, you lock the door, but how do you lock up your fuel? ASI has a solution that will give you piece of mind that your fuel is safe in your yard, and you will be surprised how little it costs. 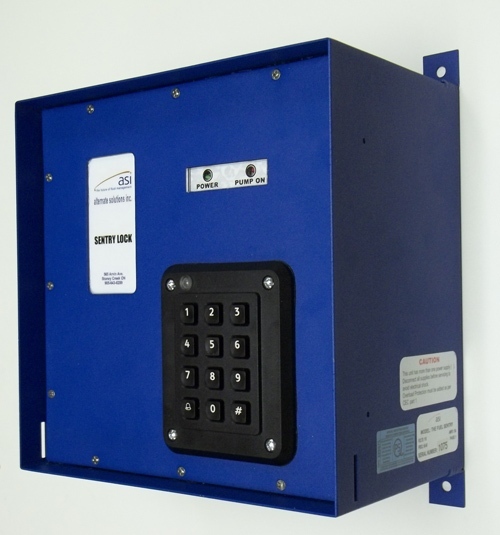 The Sentry Lock is designed to provide an economical solution to small fuelling operations. The Sentry Lock is perfect for customers who simply want to limit fuel access to authorized users. The Sentry Lock will control one pump via a PIN entry and up to 50 different PINs can be programmed. See our brochure for more info.